The United States needs to stay out of the current dispute between Russia and the Ukraine. We should withdraw our sanctions against Russia, and withdraw our threats and rhetoric as well. Let the parties involved work out the solution between themselves. Vladimir Putin is correct that there are a lot of Russian nationalists in eastern Ukraine, and a lot of others who identify themselves as ethnic Russians. Eastern Ukraine probably should be a part of Russia. Some national borders are not worth fighting over or going to war over, particularly those somewhat arbitrarily established within the last few generations. And particularly when the border fails to take account of the natural loyalties of those encompassed within an arbitrary line drawn on a map. Getting out of the way of the Russians will not harm the United States. Russia is not our enemy. We have much more to gain by retaining friendly relations with Russia than we do by attempting to fight Ukraine’s battles for them. The United States has no defense treaties with Ukraine, and that nation is not a member of NATO. Of course we do have an obligation to defend our NATO allies in Europe. It’s perfectly appropriate for us to do what we have to do to give both aid and comfort to our NATO allies. To the extent that our rhetoric is intended to reassure Europe that Russia will not threaten their borders, then we need to do just that. Barack Obama, Joe Biden and John Kerry, though, seem to be going well beyond what is necessary to reassure our NATO allies. They need to STOP IT! RIGHT NOW! Getting involved in a dispute over an arbitrarily established border in an underdeveloped eastern European country will only weaken the United States in the eyes of the world, and will take our focus off the real problems we face. It’s not our fight. Barack Obama must reestablish an atmosphere of cooperation with Vladimir Putin and seek to help restore a firm sense of security among our NATO allies in Europe. Putin is not going to try to invade Poland or Germany in this lifetime! There is no Threat from the East to our primary European allies. There is no danger to Capitalism and market economies. The fears of our allies are neither justified nor reasonable. Let it go, guys! Many leaders in Congress and in Western Europe seem to be reacting with the old Cold War mentality, a product of the Twentieth Century, and still want to “crush” the Russian Bear. Even the Obama administration seems to have a low-grade infection of the Cold War disease. Take your antibiotics and let it go, boys and girls. There is no threat to the United States, whom we love so dearly. Perhaps we are confusing love of our country with a fear of any and all change in the world. Not all change is bad, and some changes, if not good, are merely neutral to the security of both the United States and NATO. Ukraine is about the same size as the US State of Texas. 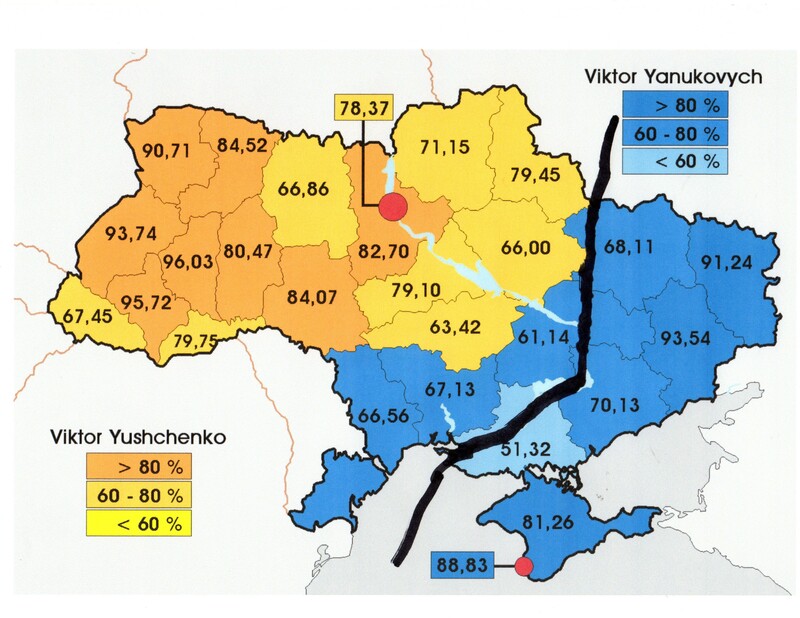 Below is a map which shows the natural fault-lines in Ukraine. The blue areas are those Oblasts (which are similar to US counties) which in the 2004 election results supported a Russian-leaning candidate. The yellow areas are those Oblasts which in the 2004 elections supported a Western-leaning candidate. There is no overlap in these results. There are no yellow Oblasts scattered among the blue, or blue among the yellow. Yellow is very yellow, and blue is very blue. Not everyone will get what they want in the Ukraine if the country is divided with part of the current area going to Russia. 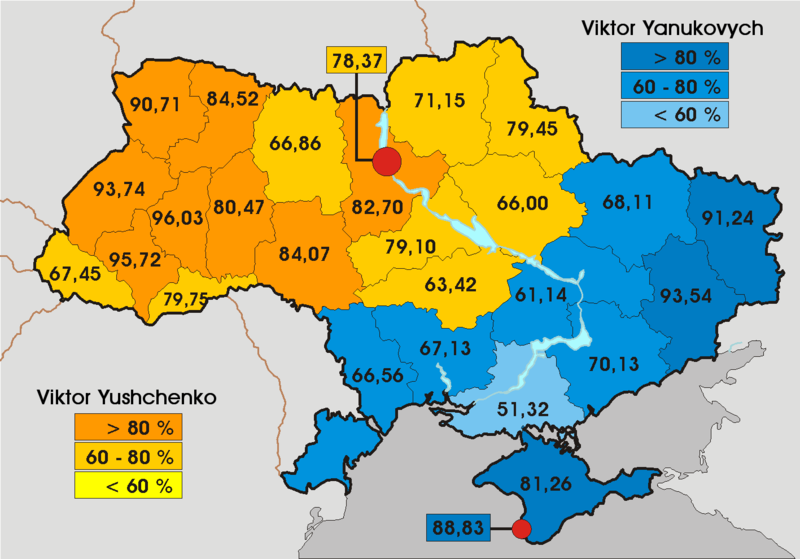 There is a natural geographic divide between the western and eastern parts of the country, which will leave several moderately Russian-leaning Oblasts in the Ukraine, and one only moderately Russian-leaning Oblast in Russia. Below is one proposed way of dividing the Ukraine. The dark black line represents the new border, and land to the east of the border will become a part of Russia. In return Russia will surrender entirely any claim on the rest of the Ukraine. There needs also, though, to be a geographic logic to any division of the country, and Ukraine must retain enough territory to retain its viability as a nation. Russia could annex the eastern part of the country along the physical lines depicted above, and there could be peace. Draw the new border beginning at the southern and eastern side of the Dnieper River from where it empties into the Black Sea at Kherson. Go up the eastern side of the Dnieper River to near the turn at Dnepropetrovsk, and then follow the eastern side of the Samara Lake. Go from there to the north along the eastern side of Highway M18, to where it ends at the intersection with Highway M03 west of Kharkov. The border could then follow along the eastern side of the railroad tracks from where they meet M18/M03, and push north to the Russian border. Borders do not need to be a cause for war, conflict or sanctions. Not always. From www.mcgeepost.com .Copyright © 2014 Michael H. McGee. All rights reserved. Please feel free to share or re-post all or part non-commercially, hopefully with attribution.